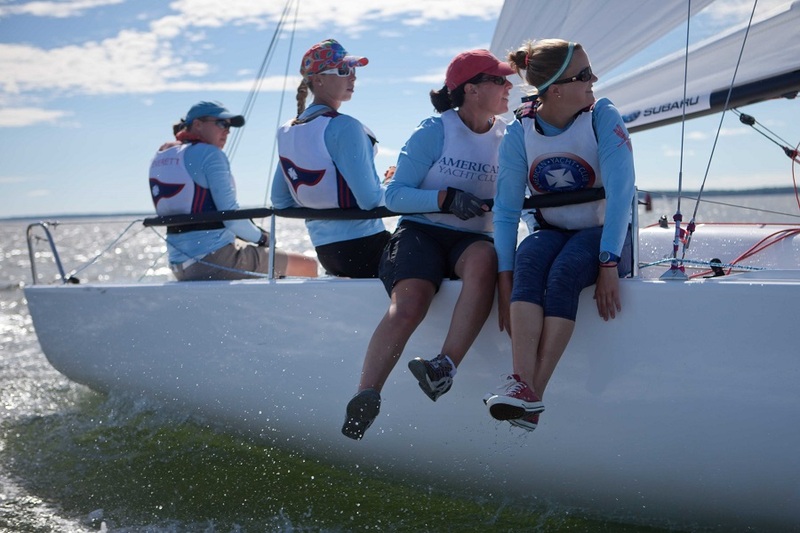 RYE, N.Y. (August 19, 2016 ) – Communal experience as a team and college sailing experience in shifty winds paid dividends for Clemmie Everett (Rye, N.Y.) and her crew, who took home the Bengt Julin Trophy for winning the 2016 International Women’s Keelboat Championship at American Yacht Club on Friday. Starting the day in third place, Everett, with crew members Alix Hahn, Carolyn Russell and Erin Sprague, finished the elimination stage of the championship with 73 points over 20 races and won two of the final stage’s three races to capture the championship. The team made a conscious effort to avoid penalties that would have cost valuable standings points. They were successful, accruing 13 points over their final five races in stage two, including a bullet and two second place finishes that placed them second heading into the championship flight, though they tried to keep that out of mind. But until their J/70 was close to the final finish line, Everett and her crew tried to keep it out of their heads. For the winners, the influence on younger female sailors could not be understated.